Abwiz Bio is continually developing new recombinant rabbit monoclonal antibodies for new targets. Founded in 2012, Abwiz Bio provides high quality recombinant rabbit monoclonal antibodies for life science research needs. All Abwiz Bio’s monoclonal antibodies are developed, manufactured and validated at Abwiz Bio’s San Diego facility. Each Abwiz antibody is stringently tested, robustly validating the target specificity for Western blot and/or flow cytometry applications. Each Abwiz monoclonal antibody is compared against the leading competitor’s phospho-specific rabbit monoclonal antibodies of the same target, when available. Abwiz’s rabbit monoclonals consistently outperform our competitors’ antibodies. 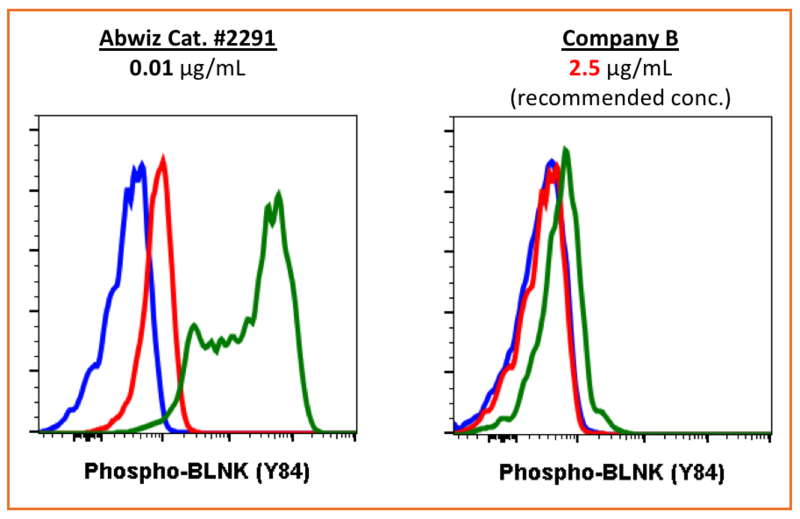 Abwiz Bio’s rabbit phospho-BLNK (Tyr84) monoclonal antibody, was compared with Company B’s antibody in flow cytometry. The data show that the Abwiz antibody gives stronger signal at 250X lower concentration, despite that the Company B antibody was tested at the manufacturer's recommended concentration. Abwiz Bio’s rabbit phospho-Histone H3 (Ser28) monoclonal antibody, was compared with Company C’s antibody in Western blot. The images were developed using the same cell lysate and reagents, and the images were collected using the same exposure time. The data show that the Abwiz antibody gives much stronger signal at 14X lower concentration, despite that the Company C antibody was tested at the manufacturer's recommended concentration. All Abwiz phospho antibodies are recombinant rabbit monoclonals. More than 100 phospho targets have entered our product pipeline, and we offer over 70 antibodies recognizing unique phospho targets. We only sell antibodies that meet our stringent validation standards. In addition to the validation data provided on each product page, all antibodies have been tested for specific binding to phospho peptide immunogen, ensuring no cross-reactivity to the non-phospho peptide. Our product pipeline is frequently updated with new products. Please let us know if there is a favorite phospho target of yours for which you would like an antibody reagent, and we will consider adding it to our development pipeline. Abwiz also offers custom recombinant rabbit monoclonal antibody development services, affinity maturation service, and bulk/custom orders. For more information, inquire at info@abwizbio.com.